Immature nymphs can be seen protruding from the cupped foliage in the early spring. Some wax ribbons are also produced by these feeding immatures. Yellowing stippling of the foliage does not appear as with other piercing sucking insects. Host plants are never injured beyond the aesthetics of leaf cupping. 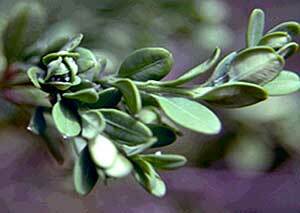 By early summer the winged adults appear, mate and the female lays eggs in the bud scales of the host plant. These adults have jumping legs and are sometimes referred to as "jumping plant lice". 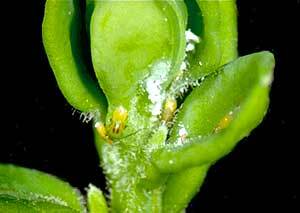 The eggs will remain buried in the bud scales until the following spring when they hatch around the time of bud-break on the host. Young, yellowish nymphs then feed on the newly expanding leaves causing enough injury for them to cup. These psyllids then utilize the protection of the cupped foliage to continue feeding while being mostly concealed, until late May into early June. There is one generation per year. Eggs hatch around 80 growing degree days. The adults will begin to appear around 300 growing degree days. Given that the eggs are well protected within the bud scales, horticultural oils are usually not effective in managing this life stage. Once leaf cupping occurs, the nymphs are also somewhat protected from oil sprays and insecticidal soaps. 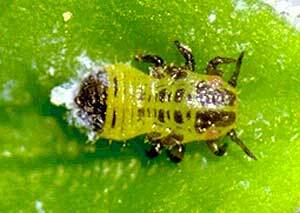 Several chemical pesticides are labeled for this pest. Injury is primarily aesthetic and, given the setting, no management intervention may be necessary.